I woke up late this morning, which is something I rarely do. I could probably attribute my sleepiness to the fact I went out for the first time this weekend since October. I have discovered that my alcohol tolerance is that of a new born baby and my recovery rate is that of an 80-year old woman. And that iPhones will not function after they fall into a toilet. Aside from being tired due to physical causes, I also feel like I’m tired from just being bored. As we welcome spring and the changes that it brings, I can’t help but think about what I was doing at this time last year. I was soaking up every second of my last semester at college. But I also remember that at around this time I got an email from New York Presbyterian, inviting me to interview at their new graduate event. A year ago I was filled with excitement at the fact that all my hard work in nursing school had paid off. Today, I am filled with excitement at the fact that New York Presbyterian called me to schedule my final scans and follow-up appointment. Same hospital. Different reasons for why they’re contacting me. There are many, many, reasons that I hate cancer. It took my hair, it took my tastebuds, it took my immune system, but the worst thing that it stole from me were my plans and my dreams. For the first time since my junior year of high school, I am not working or taking classes. I actually have always really enjoyed having a job. Not only do I like making money, but I like having something to do, a purpose. I’ve also always known what my next step was going to be. During school, I spent time securing a summer job. During the summer, I always thought about what school was going to be like. So last year, when I was graduating and going into the big-girl world, I did what I always did: I planned. A week after school ended, I landed my first nursing job. All I had to do was pass my nursing boards. And while I was studying for my boards, I babysat a baby in the mornings and took care of an elderly woman in the afternoons so that I had a little income. Plus, I love babies and I love old people, so it was work I enjoyed. After I passed, I was ready to rock. I even started looking at apartments in the city with a friend from school. But the day after that was the day the doctor told me to put my plans on hold. I dealt with the loss of my hair. I dealt with not being to able to eat hot dogs. I dealt with the nausea of chemo. Because all of that was temporary. Hair would grow back, I could eat however many hot dogs when this was over, and nausea, though sometimes I thought I would never be able to get out of bed ever again, would eventually subside. But having to put what I had worked so hard for, what I had wanted so badly, on hold, really stung. And it still does. I haven’t been working recently, no babysitting, no store, just kinda because as I neared the end of my treatments, it was hard to predict how long the nausea would last, therefore I never knew when I could work. So now, I pretty much just sit around my house all day. And some of you are probably like wow why is she complaining that literally sounds amazing. But I have to tell you, when it’s not your choice to not work, and you’ve watched pretty much everything on Netflix, life is very, very boring. Plus, I’ve always been a person who hates not having anything to do. Never been so thankful for a Tuesday because this blog gives me something to do. So I was freaked out this morning when I woke up two hours later than I normally do. I feel like because I don’t have a job I have become lazier. I feel like I’m missing out on something because I don’t work. But as I sit here and write, I know that that’s not true. In a strange sense of the word, I find myself to be lucky in this particular situation. Maybe a better word is fortunate? Idk, I scored lowest in the vocabulary section of the SATs. But, I feel lucky that I could afford to not work during my treatments. Lucky that I don’t have to rush back to work now that I am done. Lucky that my job is being held for me, so that when I’m ready, I can jump right in. My mom has told me that my purpose right now is to get better. And I often have to remind myself of this. Before I can help make others better, I have to get better. How can I tell someone to rest and take it easy, if I never did that myself? Although I’m being so cliche right now, this whole experience has taught me that you really can’t plan for everything in life. So the next time something doesn’t go according to plan, I won’t be so upset with myself that I didn’t see it coming. I am learning to be happy that I can take the next couple of months to just enjoy life without distraction. I am not where I am suppose to be, and that’s ok. Because really, are any of us? 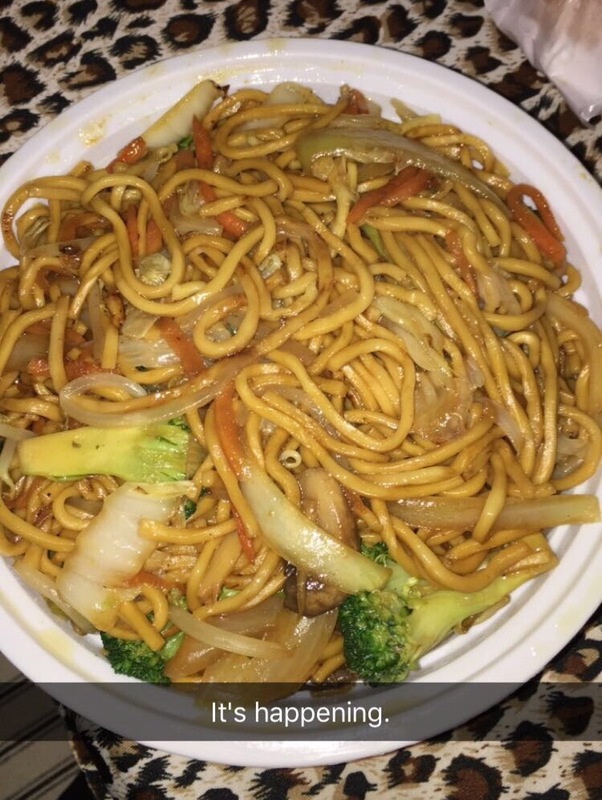 On a lighter note: I ate Lo Mein this weekend and nothing bad happened and it awakened my tastebuds. A step in the right direction. St. Patrick’s Day out AND Lo Mein!! Look at you! You’re getting there Katie, but I completely understand. You’re a woman of action and stepping back and handing your life over to God to direct for a while is really, really hard. We have no time for it because there’s too much to do. My sister is so right (as usual)…time to rest and recover young lady. You’re getting better and stronger each and everyday you’re past chemo. You’re life is still there waiting for you when the time is right. It’s coming love and boy when it does – LOOK OUT WORLD, HERE COMES KATIE.